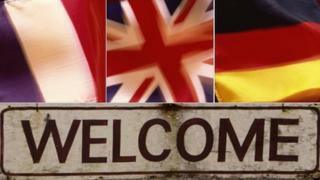 British towns are starting to scrap their twinning arrangements with continental counterparts. Why are they doing so, and do such links have any purpose in the 21st Century? At first glance, there's very little that Glasgow, Scotland, and Havana, Cuba, have in common. Likewise, it's not easy to spot similarities between the genteel Oxfordshire town of Henley-on-Thames and the Somali city of Borama, or indeed Sunderland and Washington DC. And yet all three pairs of settlements are formally pledged to the closest bond of civic siblingdom. All are twinned. The notion of twinning - known elsewhere as sister cities or friendship towns - is a tradition stretching back almost a century in the UK. And yet while such arrangements once symbolised an idealistic postwar sprit of reconciliation, a string of newspaper stories combining local dignitaries and alleged overseas junkets have reflected a shift in public attitudes. It's a mood on which politicians have begun to capitalise. In September 2011, councillors in Bishop's Stortford, Herts, voted to end local authority support for the town's 46-year twinning arrangements with Friedberg in Germany and Villiers-sur Marne in France. Rejecting charges of insularity, local councillor John Wyllie insisted the practice "didn't have as much relevance in today's society". The council also denied reports it was motivated by Euroscepticism. Civic leaders in Wallingford, Oxfordshire, contacted the European Municipalities and Regions (CEMR), which co-ordinates twin town arrangements, in 2009, asking to break their ties with Luxeuil-les-Bains in eastern France amid complaints that the latter had not put any effort into the relationship. Doncaster Mayor Peter Davies announced in the same year he was scrapping twinning links with five cities to save cash. At the time, Davies faced criticism from councillors who argued he was sending out a signal that the town was insular and wilfully ignorant about the world outside. But now he insists the move has proved popular with voters. "I don't think I've had one complaint from a Doncaster resident," he says. "There's no evidence that it made a blind bit of difference to Doncaster's economy. "The idea that cultural links have been lost is nonsensical. Only about a dozen people ever benefited from these trips. I can see that it arose out of altruistic motives after the war, but it just became about junkets." The scheme was not always regarded thus. Keighley in West Yorkshire was the first British town to forge a "sister cities" link with Suresnes and Puteaux, France, in 1905, and subsequently "adopted" the French commune of Poix-du-Nord in 1920. But the practice took off in earnest after World War II, with community leaders keen both to heal the divisions of the conflict and seek support in rebuilding. Coventry, which suffered heavy bombing, twinned with Stalingrad (now Volgograd) and then Dresden, which had suffered similar fates. The turning point in public attitudes appears to have come in the 1980s, when battles flared between Margaret Thatcher's government and several left-wing councils. In particular, the 1980 decision by Dundee - partly influenced by local activist George Galloway, the future Labour and Respect MP - to twin with the West Bank city of Nablus, flying the flag of the Palestinian Liberation Organisation from the city chambers for good measure, became the focus of opposition to such arrangements. But the notion has not entirely died out, even if its contemporary manifestation often differs radically from traditional formats. In October 2011, a Conservative councillor proposed twinning Royston, a sleepy town of 14,570 souls in the Hertfordshire Chalk Downs, with Benghazi, fulcrum of the Libyan rebellion. In 2009, Swindon - the Wiltshire industrial town often used as a synonym for prosaic suburbia - agreed to twin with Walt Disney World in Florida. Seven years previously, Wincanton in Somerset went one stage further by twinning with Ankh-Morpork, an entirely fictional city that appears in the fantasy novels of Terry Pratchett. For supporters of the practice, such gimmicks might be going too far. But even advocates acknowledge that the scheme has to adapt if it is to survive. Max Hill, a retired languages teacher from Sandy, Bedfordshire, is responsible within his town's twinning association for its link with Skarszewy in northern Poland. Contrary to the stereotype, Hill says, Sandy's councillors have very little involvement in the link, which - like most twinning arrangements in the UK - is largely managed by community volunteers. The focus of the connection comes each summer, when pupils from Sandy's schools travel to Skarszewy to teach English. The visit comes at no cost to the British taxpayer, Hill says - students fund their own flights and their accommodation and food is paid for by the Polish local authority. "The kids get a huge amount out of it," he says. "They're in a totally different environment, they learn a lot and they make friends. "They broaden their perspectives - cultural, linguistic, social. As a country we remain very insular - we're probably not as bad as the Americans, but more so than most countries in Europe." Crucially, Hill believes that the Skarszewy link has thrived because the UK and Poland remain distinct enough culturally for both sides to learn enough from each other. By contrast, he believes, many tie-ups with closer European counterparts have dwindled in relevance since the post-war era as cheap travel has become more widely available and communications links have improved. Indeed, of the UK's approximately 2,000 formal twinning arrangements, 50% are with France and 23% are with Germany, according to the Local Government Association. For this reason, communities may need to look further afield - particularly to emerging markets in China and India - if the system is to remain relevant, according to local government expert Tony Travers of the London School of Economics. Likewise, he believes, such schemes will have to make better use of communications technology in place of physical "fact-finding" visits if they are to avoid tough questions about the use of public funds. "People travel so much more that the idea of fixing on one place is slightly inconsistent with the free movement that many, if not all of us, expect. "Public sector austerity means that some marginal activities are harder to justify even if they don't cost very much. "With Skype and the internet, you don't have to have coachloads of people travelling around to civic receptions." It's a paradox that as the world gets smaller, friendship links become more difficult to maintain. As is so often the way, however, the web may help distant siblings stay in touch. Correction: 13 January 2012: An earlier version of this story might have been taken to imply that Bishop's Stortford's decision was made in the wake of David Cameron's EU treaty veto. This would not have been the case as the council's decision was made two months earlier. This part of the report has been amended.